When it comes to coffee percolators, people honestly just don’t know what they are or that they even make coffee. The fact is, using the best coffee percolator money can buy will get you amazing coffee results like you have never had before. A coffee percolator works just like any other coffee machine but with a couple of important differences that set it apart from the herd. It is basically a cross between a coffee drip machine and a tea kettle. Inside the percolator are two chambers, one on the bottom to hold the water and one on top to hold the coffee grounds. The coffee percolator usually can work on any heat source directly. As the water heats up, it is forced through a separate tube upwards and drips on to the top chamber with the coffee grounds. The hot water then passes through the coffee grounds and then through a filter before it makes its way back to the original bottom chamber. This process happens over and over until the water begins to boil and the pot begins to push out steam creating a loud spitting sound, hence the percolator. While the method may be the same for percolators, different models will work differently from one another. The flavor of the coffee from the percolator is going to be boldly strong almost like coffee from a Nespresso machine. Some people do not prefer such a strong taste but those who use a percolator like it. The percolator has been around for more than 200 years and is still being used today. There have been some advancements and improvements made to the kettle to help make a better, faster coffee. In this article, we will go over what to look for when purchasing a new coffee percolator. We will also cover some of the coffee percolators available for purchase on the market today and which may or may not be a good choice to go with. Trying to get that strong coffee taste without having to buy an espresso machine? Well, you are in luck because for the most part, most coffee percolators are very inexpensive and will deliver the same great taste every time. You can find a coffee percolator for as low as $20 which will still do a better job than trying to find an espresso machine under $200. Most of the old school coffee percolators are strong and durable and meant to last forever even if they are placed directly over fire. However, with this day in age, coffee percolators have made vast improvements to the design and some are now even electric. With that in mind, it is best to make sure your coffee percolator is covered by some kind of warranty to protect it from any defects or damages that may occur while in use. You want to have a strong and durable product that will be able to deliver a great cup of coffee on the go or at home in the kitchen. Remember, the price of the coffee percolator does not determine the quality of the machine. Just because it is the most expensive percolator, does not always mean it will be the best. Make sure to look over the facts and read plenty of reviews before springing in to action to buy a very expensive percolator when a cheap model could probably do a better job. First off, you want to know how much coffee you will be making on a daily basis or per brewing cycle. Coffee percolators come in many different sizes from 2 cups of coffee all the way up to 15 cups of coffee. So, if it is just you and your spouse, you might want to think about a 2 or 4 cup percolator. If you are needing a lot more coffee, then the larger sizes may be the way to go. However, they say that the smaller the coffee percolator, the stronger the brewed coffee. Depending on the heat source you wish to use to heat the percolator will determine what style of kettle you will want, whether it is electric or not. If you don’t have a problem with a heat source then maybe go for the non-electric type. This is the same kind being used for generations and can even be used outside on a grill or open fire. If you want a little more convenience, then go with the electric percolator. These work almost the exact same way a coffee drip or espresso machine would work. Just add the coffee, water, set it and forget it. If you plan on buying an electric percolator, look to see if the machine has special features like a whistle or light to let you know when the coffee is down. Other features like stirs, filters and pour spouts are also very helpful when using a percolator to make coffee. Also, make sure the percolator is easy to clean as they can be quite difficult to wash with their inner workings. If a coffee percolator is dishwasher safe, this is a huge added bonus that makes life much easier. Knowing how to clean your percolator the correct way will save you some time in the future. Most percolators share the same design but there are a few made of various materials. The best route to take would be to spring for a percolator made of metal, preferably stainless steel to make cleaning easier and protect it from rust and damages. There are other types like ceramic that are a little more decorative if that is your thing. And then some of the travel size models are made of silicon and enamelware so that they breakdown and store easily. Right off the bat we have a great electric coffee percolator that comes at a very modest price but does not come protected by a warranty. This percolator has the ability to brew up to 12 cups of coffee at one time and will brew it in less than 10 minutes. The percolator is constructed of beautiful brushed stainless-steel inside and out, including the inner workings like the plate and pipe. It will brew strong and bold coffee every time as well as keep it hot for however long you want. The elegant design allows you to use the kettle as a pot to serve the coffee in to your guests and also has a light to alert you when the coffee has finished brewing. This would be a great addition to anyone who likes to entertain guests or just drinks a lot of coffee. Has the ability to brew up to 12 cups of coffee in as little as 1 minute per cup. The percolator is constructed of brushed stainless-steel inside and out which not only looks elegant but also is very easy to clean. The coffee percolator has a red light to alert you when the coffee is finished brewing. The pot is quite large and may not be suitable for a one or two-person home. The coffee percolator does not come with any kind of warranty. 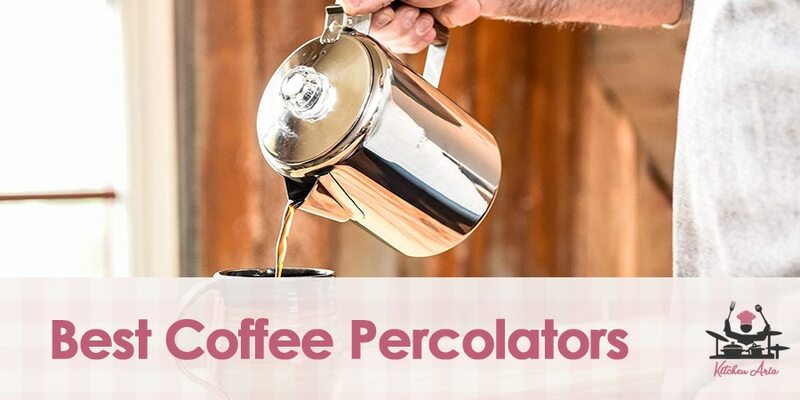 The next percolator is one of the best for a reason, simplicity. Not much has changed on this kettle since it was first invented, only improved. The coffee percolator makes a little more than 1 cup of coffee at a time which is perfect for a single household. The body and inner workings of the percolator are all constructed of stainless steel and are all dishwasher safe to make cleanup easy. It is able to be brewed over any kind of heat source including open fire but is recommended for stovetop use and will brew the coffee in about 5 minutes. This is a great little percolator and it comes at a very fair price. Plus, it is also protected by a 2-year warranty. Is able to be brewed over any heat source and will brew coffee in about 5 minutes on the stovetop. Constructed of stainless steel and completely dishwasher safe which makes cleanup very easy. Is protected by a 2-year warranty and is not that expensive. The coffee percolator only brews a little more than a cup, so if there is more than one person drinking coffee, there may be a little bit of a wait. This coffee percolator is also a great buy for any small family. While it does not come with a warranty to protect it, it is very cheap to purchase. The body and inner workings are all made of stainless steel and polished to a mirror finish so it looks great on the stovetop. It is also completely dishwasher safe which makes clean up very easy with no mess. The percolator is able to brew up to 8 cups of coffee at one time and comes equipped with a slip resistant and heat resistant handle to pour your coffee without worrying about hot surfaces. It is constructed of stainless-steel inside and out and polished to a mirror finish for display purposes. The product is also 100% dishwasher safe and breaks down very easily. Is able to brew up to 8 cups of coffee at a time and comes with a heat resistant handle for safety. Does not come protected by any kind of warranty but is still very cheap to buy. Here is another electric coffee percolator that is fairly priced at around $40 but does not have any warranty attached it to, so be careful. The coffee percolator is able to brew up to 4 cups of coffee at once and can do so in about 4 minutes. It will also stay on and keep the coffee warm over time. The body is constructed of stainless steel which is easy to clean and looks nice as well. The handle and top knob are also cool to touch meaning they will not get hot when the percolator is brewing. The percolator is able to brew up to 4 cups of coffee at once in under 5 minutes. The body is constructed of stainless steel which makes it easy to clean. The handle and top knob are heat resistant for safety purposes. While it does come at a fair price, it does not come protected by a warranty. This coffee percolator is a wolf in sheep’s clothing when it is compared to other coffee percolators. It comes at about the same price as the rest and is not covered by any warranty. The body is made of stainless steel that has been polished to a mirror finish to look great on the table or stove. However, the handle is made of wood and the top knob is made of glass. While this may look appealing, it is not that practical in a safety sense. The percolator is able to brew up to 9 cups of coffee at once on the stovetop and is also completely dishwasher safe. The body is constructed of stainless steel and polished to a high finish. Has the ability to brew up to 9 cups of coffee at once. The percolator is also dishwasher safe and easy to break down. Does not come with any warranty. The handle and top knob are not heat resistant which may cause some safety hazards. Here is another electric coffee percolator that is still at the same price as the rest but with less helpful features. It also is not backed by a warranty of any kind. The percolator is constructed of heavy stainless steel and has heat resistant handles and top knobs. It is able to brew up to 12 cups of coffee within minutes and also looks nice on the table for serving. There is a red light to alert you when the coffee is done brewing and a setting to keep it warm. However, this percolator needs to be washed by hand which is a daunting task and can be quite messy. Is able to brew up to 12 cups of coffee within 10 minutes. Is constructed of heavy stainless steel and polished to a high finish. The percolator has a red light to alert you when the coffee is done brewing. Does not come protected by a warranty. Needs to be handwashed; it is not dishwasher safe. Here is a great option for a coffee percolator and it can be used inside or outside. It is also the cheapest percolator on our list and is backed by a full lifetime warranty. The percolator is constructed of heavy 3-ply aluminum which is able to evenly distribute the heat but also may be prone to damages and dents because of the soft metal. The outside is also coated in an enamel finish which can come in a variety of different color schemes. The percolator can sit right on the campfire and brew up to 8 cups of coffee in an ample amount of time. It is also dishwasher-safe and very easy to break down. The coffee percolator has the ability to make up to 8 cups of coffee inside on the stovetop or outside on the campfire. It is coated in an enamel finish which comes in different colors. The percolator is very cheap to buy and is backed by a lifetime warranty. The body is constructed of aluminum which is great for even heat distribution, but is prone to damages and dents because of the soft metal. So, if you are in the market for a stronger coffee or are just looking to replace your old coffee maker, then you should really consider purchasing the best coffee percolator. Your morning cup of joe will never be the same again after using a coffee percolator. So, perk up! It’s time to buy a percolator.